For years I have avoided using the auto tool setting function in my Control software. While it is an excellent way to set your cutters height accurately and repeatably it does not suit my style of machining. I like to change where I reference my cutter to during my project machining and a standard tool setter will not work for me. Over the Christmas break I got to thinking about this and whether there was a way to use a tool setter. 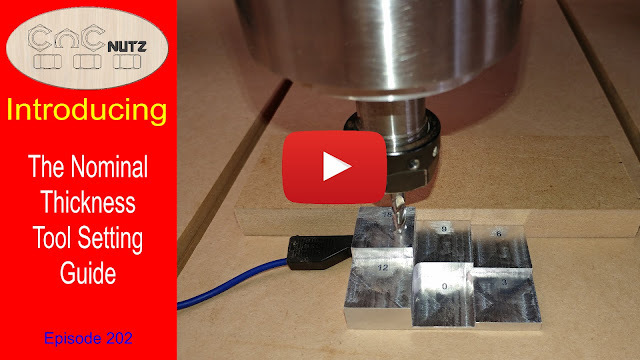 This is what i came up with and in last weeks episode I machined up a piece of Aluminium to create a custom tool setter that covers most of the common material sizes I use. This video shows how the tool setter works and more importantly why I need one like this. I decided on the most common stock heights that suits my projects and these will cover 90% of what i do. The the times when there is no available step I can either return to manual tool setting to the spoil board. The one great weakness of this tool setter is it cannot reasonably be expected to cover every material nominal thickness without getting very large and unwieldy. That said it has many more than a standard touch off plate so it stands to reason it is more versatile. In my personal machining if my material thickness falls between 2 steps I would use the bigger of the 2 steps and lie to my Cam software telling it that the material was the larger thickness. Again anything that needs to be machined referenced to the material top I will simply zero the cutter to the material surface and when cutting through the material I will simply zero using the nominal thickness height I told my CAM the material is. Sure the first cut will be a bit high but the important thing is the final pass will be spot on, cutting through the material and leaving the spoil board undamaged. This is the metric version but an imperial version can just as easily be made to cover the common imperial material sizes. The 2 Tools setters are not interchangeable. You need a metric one for a metric machine and an imperial one for an imperial machine. Let me know what you think of this project. Does it have a future or do you think it makes machining needlessly complex. Post a comment in the Youtube comments and share your thoughts. All opinionsare welcome. Until next time happy machining.